Basket bags and Shrink bags are an easy way to provide a finishing touch to your baskets and boxes while still keeping them visible and protected. 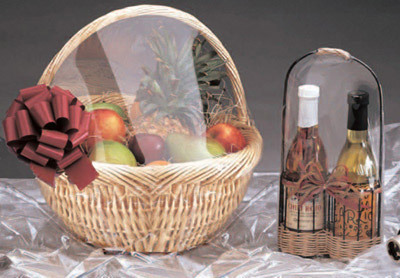 Shrink bags are made from PVC and Basket bags are made from polypropylene, both of which provide superior clarity. Shrink bags shrink at the lowest temperature possible by applying heat to the bag. Basket bags retain their shape and don't shrink. Both the Shrink and Basket bags meet FDA requirements for direct food contact.